Molecular Breeding and Nutritional Aspects of Buckwheat describes the general characterization and genetic diversity of buckwheat (family Polygonaceae, genus Fagopyrum) around the globe (especially in Russia, China, India, and Eastern Europe), the arid and cool regions where it is most frequently consumed, and nutritional information on a variety of buckwheat uses, including tea, groats, flour, and noodles. 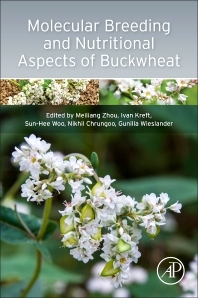 With detailed information on buckwheat regeneration, genetic transformation, gene function analysis, and the metabolic engineering of bioactive compounds, the book guides readers through a variety of buckwheat varietal adaptations, providing foundation information on which additional research should be conducted. It is divided into four parts, including genetic resource and phylogenetic relationship, food nutrition, growth and cultivation, and molecular breeding, with each section providing insights into the most current developments. Bachelor, master, PhD students of Agronomy or Plant Biology and buckwheat researchers seeking a comprehensive overview of present knowledge about the molecular breeding and food nutrition of Buckwheat. Controversial Opinions: Is F. Cymosum Phylogenetically Close to Common Buckwheat or Close to Tartary Buckwheat? Dr. Meiliang Zhou (Biotechnology Research Institute-CAAS/Sichuan Agricultural University, China), Regulation of gene expression; Plant development; Functional genomics; Hormones signaling transduction mechanisms; Plant-biotic (microbe, insect and virus) interaction; Plant-abiotic (drought, salt, flooding, heavy metals, cold and high temperature); Plant secondary metabolites biosynthesis pathway and regulation mechanism; Plant nutrition. • A two locus barcode based on nucleotide sequences of cp rbcL and matK genes developed for identification of Chenopodium quinoa an important nutraceutical crop of Indian Himalayas. • Granule bound starch synthetase (GBSS-I) isolated from buckwheat grains. Academical degree: Physician and MD 1977, licensed to practice medicine since 1979. Specialized in Occupational medicine at Uppsala University in 1986. Ph.D. degree in occupational medicine at Uppsala University in 1995 on Water Based Paints and adverse health effects. In January 1999 associate professor at Medical Sciences/ Occupational and Environmental Medicine. Senior consultant in medicine 2001. Specialized and licensed as a physician in environmental medicine in 2003 and specialization into aviation physician by the Swedish Civil Aircraft Board in 2004 and work parttime with Scandinavian Airlines, consultant and researcher. Scientific secretay in Swedish Aviation and Nautical Association since 2007 and member since 2012. Ongoing international cooperation with researchers from China. In China, through Professor Wang and Professor Zheng cooperates on biomedical and allergy research in buckwheat with Shanxi Academy of Agricultural Science, Taiyuan, PRC, and Department of Life Sciences at Shanxi University.